We moved and are all settled in again. This is the final move before we move again in the autumn. Say what you will about Ikea, but their furniture is really great for breaking down into small, moveable bits and it made our move a lot easier (though it was still stressful). One thing that is always good about moving is that it forces us (me) to pare down our (my) stuff. I have more things than Angie as I tend to be a bit of a pack rat and sometimes keep things for sentimental reasons or because I think something will be a good resource for a drawing etc. For example, I have a small, but growing, collection of dead insects and insect bits that I have found on walks. During this last move I tried really hard to be ruthless about my possessions and got rid of quite a few boxes of stuff. I did get to keep my insect bits though. During the move I listened quite a bit to the Super Furry Animals, a brilliant Welsh band who even sing in Welsh. When I was listening to them I started to put images to some of the songs and decided to create one of the series of images in a comic strip format. These images go along with the song, Hello Sunshine, off the album Phantom Power. 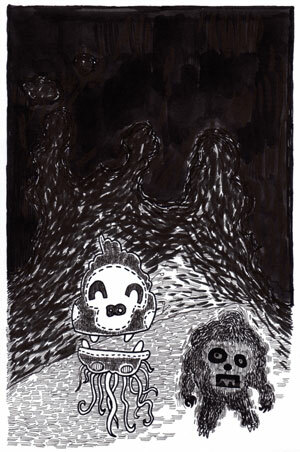 The images were drawn with Sakura pens on Bristol Board (2 boards, at 9″ x 12″). 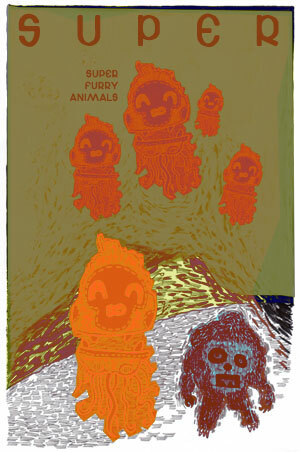 To learn more about Super Furry Animals, visit the official website at www.superfurry.com. They also have an informative entry in wikipedia, that can be found at www.wikipedia.org.